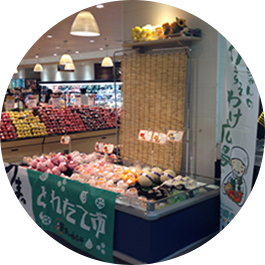 Global Ichiba operates a unique business platform called “NIPPON ICHIBA,” which enables suppliers and consumers of Japanese fresh fruits and vegetables to find, communicate, and trade products with the best partners. Through NIPPON ICHIBA, we deliver safe, reliable and most importantly, oishii (delicious) Japanese fresh fruits and vegetables to customers all over the world. 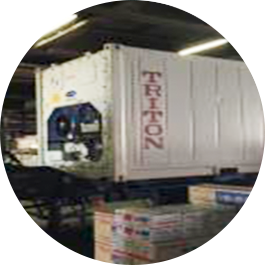 We have established a dedicated, vertically integrated logistics system for the transport of fresh fruits and vegetables from Japan by leveraging available technologies through partnerships. We deliver Japanese fresh fruits and vegetables at affordable prices through an exhaustive rationalization of logistics. We assure consumer satisfaction through food safety and security by enhancing traceability throughout the value chain. We created a new platform that eliminates information asymmetry to enable both suppliers and consumers to execute outstandingly transparent and fair transactions. We provide an environment for smooth transactions on our platform by simplifying associated procedures. We penetrate new markets by connecting suppliers and consumers on our platform. Meeting local demand through our intelligence services for suppliers’ “Market-in” activities. We make every effort to understand actual demand and gain insight of the markets through the operation of our platform and ongoing market surveys. We enhance Market-In food production in Japan rather than Product-Out by providing periodical market information feedback to suppliers and producers. 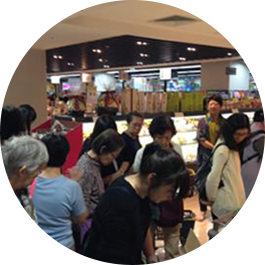 We increase consumer satisfaction of Japanese foods through these consultation activities. Global Ichiba is committed to consumer satisfaction by delivering outstanding quality Japanese fresh fruits and vegetables that our agricultural partners nurture with great care. Through “NIPPON ICHIBA,” Global Ichiba has built a brand-new export system of fresh fruits and vegetables with enhanced traceability. To address growing global concerns for food safety and security, the core value of our activity is enhancing traceability, i.e. information about where and by whom our food products are produced and how they are delivered. Starting with the Hong Kong market, NIPPON ICHIBA will expand its business to other major cities in Asia. We currently export products to Hong Kong. We verify the product’s freshness during break-bulk sea transportation, possible sales period, and price competitiveness compared to products from competing countries. We have shipped more than 20 green grocery items using break-bulk cargo. By controlling the temperature and implementing an ethylene absorption technology suited to the characteristic of each product, we have established a sea transportation method that maintains product freshness. More than 1 week sales period. 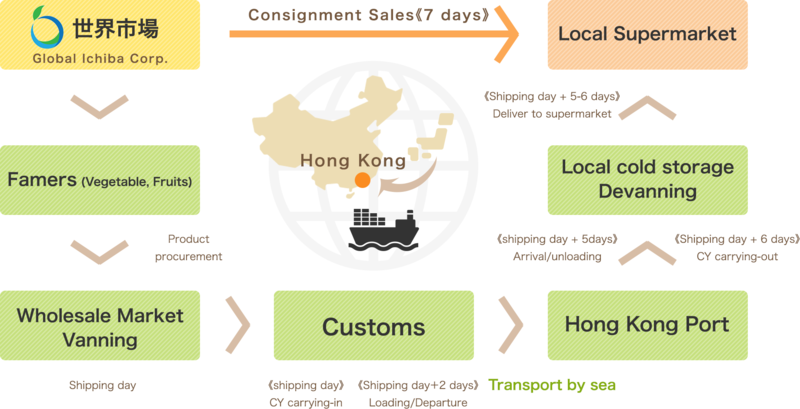 We have confirmed that the products exported to Hong Kong by general reefer container can be sold for at least one week in local supermarkets. We have confirmed that our products can be sold at a competitive price compared to products from competing countries. 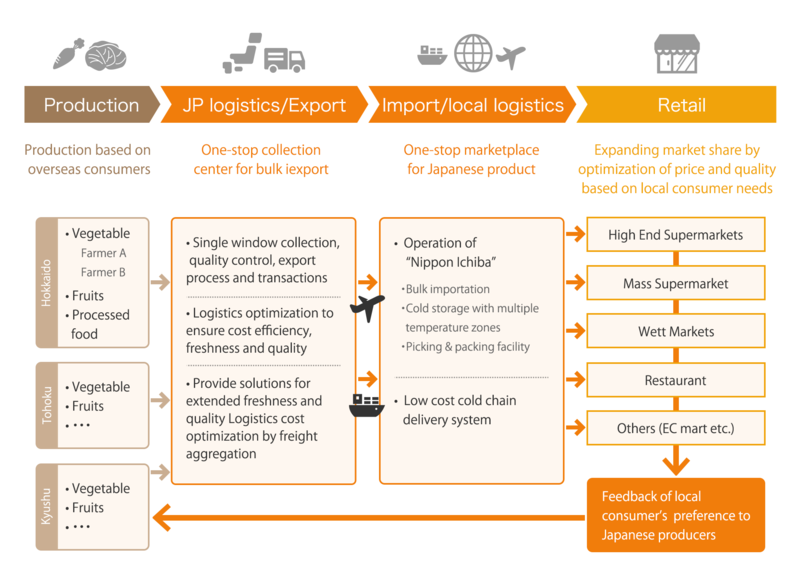 Global Ichiba seeks to collaborate with local players in the food delivery value chain, such as food suppliers, wholesalers, and etc., who are interested in our platform, NIPPON ICHIBA.